Welcome Back!! How was your Thanksgiving? Mine was wonderful, my daughter really brings this house to life. Cooper keeps checking all the rooms wondering where she went. Happily for us all, she'll be back soon for Christmas. 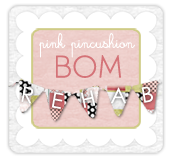 I was so busy I did not even miss my sewing room, but now I'm eager to get back to it. It will be hard with the decorating and partying to be productive but my peace of mind depends on me getting in some sewing time. Have you noticed, little by little, I'm blogging about all the quilts I've made, here's Quilt # 44. This is a stack-n-whack quilt. I made this quilt this summer after attending a class taught by the the stack-n-whack queen herself, Bethany Reynolds. I've named the quilt "Kara's Jungle" because I plan to give it to my niece Kara for Christmas. She currently has a jungle theme thing going on in her room. Bethany Reynolds has created a clever way to make kaleidoscope looking blocks by stacking then cutting the fabric. The pattern for this class was called "Check-er-board Tiles". She has several patterns, they all use this stack and whack method. I enjoyed the class, Bethany was an easy going and fun instructor. The fabric is by Laurel Burch and is called Secret Jungle. Here's what the fabric looks like before it's cut. This is how it looks once it's pieced. It's fun to see how each block turns out based on the cut fabric. The pattern called for the blocks to be connected with no sashing, but my corner pieces did not match-up perfectly so I added the sashing and cornerstones. I think they look better this way! This was fun to try but I think this will be my one and only stack-n-whack quilt. And remember to Eat More Pie! I'm all done with my Red Snowball challenge quilt, so I packed up my cream leftovers. I have a great drawer full of cream scraps. They stay in the second drawer of this storage container in my closet. Just waiting for the next project that requires cream scraps. No next project material on my fabric rods. My baby girl is home for Thanksgiving. No sewing until after the weekend! I got that red snowball quilt done just in time!! Here it is, my red snowball challenge quilt, which I have named, "He Knows When You Are Sleeping". It's Quilt # 52 and finished at 60" X 72". I'm am so happy with this quilt. I enjoyed swapping the creams, making the blocks, and looking at those smiling Santa faces everyday for 10 days. At first I thought about going with a black inner border, and putting a block in the corners to separate the Santas. I quickly dropped the black in favor of red. But I didn't like how this block looked in the corner. So I made a different block, but I didn't like it either. In the end, I decided I wanted uninterrupted Santas surrounding the snowball blocks. I matched the corners up as well as I could. I think once it's quilted it will be hard to pick out where the Santas meet. I plan to use this material, cut on the bias, for the binding. It's a companion fabric to the Santa fabric. I'm going with cream Moda flannel for the back. Thanks again to Allyson and Nicole for hosting the challenge, thanks to my cream swapmates, and good luck to all who are joining this challenge. I look forward to seeing your quilts. The quilt looks so much better in person, these poor pictures do not do it justice. I finished my "He Knows When You Are Sleeping", aka Red Snowball Challenge, quilt top today! I could not be happier with the end result, plus the piecing was a breeze. Thanks Nicole and Allyson, I would never have made the quilt if it weren't for your challenge. It's a rainy day here today so I could not get enough light to get a good picture of the finished product, so instead I'm sharing a couple of techniques I used to assemble the quilt. First, I arranged all my blocks on my design wall, to get the best placement and to avoid duplicate fabrics being side by side. But when I started sewing the rows, unless I worked with two blocks at a time, I was all the time mixing up my perfect placement. Since my quilt had 8 blocks per row, making 4 sets of 2 blocks, I numbered the heads of these pins to keep track of their order. (I just used a permanent marker) So working on a row at a time, I would mark the blocks of the two block sets 1 through 4. Once the singles were sewn together, it was easy to keep track of which sides should be sewn together next. Here's another little tip for piecing your border strips, "stay out of the crotch". it's easy to remember not to draw your line the wrong direction if you think, "stay out of the crotch". See how this line stays out of the "danger zone". When I go to sew the pieces, I line my needle up right on the drawn line, then hit the needle over button on my machine one time. The stitches run right down the side of the drawn line. I hope these little tips help you the next time you're assembling your quilt top. Hopefully the sun will shine soon and I'll be able to share pictures of my top. It probably won't be quilted in time for the holidays this year but it will be ready for next year. After reading all the Cross Country Christmas Blog Hop posts today with all their Christmas quilts, I've decided for sure, "I need more Christmas quilts" ! And a few more over here.....22 houses unpacked, plugged in and ready for Christmas, 40 more to go. I'm also making progress on my Red Snowball Challenge, or as I'm calling my quilt, "He knows when you are sleeping". I've got all the blocks made! If you follow the pressing instructions they really go together easily. I hope the rows go together as easily. As I mentioned Monday, I'm throwing a few Santas in the mix with my cream snowballs. I've decided on 9, here's the random pattern I'm going with. The Santa faces are so appealing, this one looks like he's deep in thought.....probably wondering if Thelma's been naughty or nice . . . I think this Santa looks tired but he's got a great beard......I love each little rosie cheek. Nicole, at Sisters Choice, had a blog yesterday about shoes, which made me remember of funny shoe story of my own. I'm not really a shoe person, it's just not in my blood. The first year after I retired my primary shoes of choice were tennis shoes. Summer, winter, fall, spring, I was in tennis shoes, and loving it! these...they're Rocket Dogs!! My husband laughed when he saw them, but they are all me!! It's Beginning To Look A LITTLE Like Christmas . . . . . .
Hello, how was your weekend, it was a busy one here, the time just flew by. We started the process of getting ready for Christmas this weekend. My husband helped me get all my Department 56 Christmas Village houses down from the attic. It's definitely a two person job. I get up in the attic and drop the boxes down one by one. My husband does the catching and stacking. I started collecting these Christmas houses over 20 years ago. I would get a few each year as gifts from family and before I knew it I had a whole town. Every year I say I don't have room for any more, then a new one comes out that "I just need" to complete my collection. I set them up all over the house. I get them out before Thanksgiving for several reasons. First, my daughter is only home for a few days at Christmas, so I like to get some of the decorations out for her to enjoy at Thanksgiving. I also like to take my time setting them up, I enjoy looking at each one, the details amaze me every time. But mainly, I just like having them out, they are the first decorations up and the last I put away. From the beginning I've always written the date I got the piece and the name of the person who gave it to me on the box. This one was from my Grandmother in 1992, she sadly passed away a couple of years later. But I think of her often, and always when I get out this house. Looks like I picked this one up while on vacation in South Carolina in 1991. I could not pick a favorite if I tried. Although this pie shop is pretty darn cute. Even the back of the houses, which folks don't normally get to see, have interesting detail. Here's a coat and broom by the back door with snowy logs stacked on the step. Stay tuned for pictures as I get these houses all set up for the holidays. I also squeezed in some sewing this weekend. I worked on snowballs for the Red Snowball Quilt Challenge. I thought I had all my red snowball blocks done. I thought I counted 40 plus 3 extra. But when I put them on my design wall for this picture I came up short. Not only did I not have the extra, I didn't have the 40 I needed. I'm not sure where I went wrong. My goal was to have all my red blocks done this weekend, and I had the time, if I would have counted correctly. That's OK, I have plenty of half square triangles made up ( as I've mentioned before, I'm an over cutter) so I'll make a few more then get started on the cream snowballs. I've got around 40 different red fabrics in the red blocks. 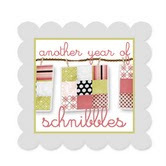 Here's the pattern for November for the Year of Schnibbles challenge, "Picnic". I was so excited when I saw the pattern that Sinta and Sherri had selected. 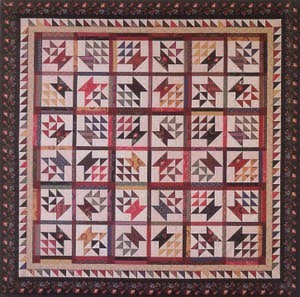 As I've mentioned before, I'm fairly new to quilting , so I have a long list of first quilts that I want to make. My first basket quilt is on that list. While I loved the fabric used for this pattern, I was not in the mood to work with what seemed more like summer colors, but that's OK, I thought maybe I could switch things up by going with a "Christmas baskets in the snow" type theme. Well you know me and Schnibbles, we don't see eye to eye on size. Schnibbles are very clever patterns that use charm packs to their biggest advantage. The patterns seem to run in the neighborhood of 33 inches square, give or take. I like to supersize my Schnibbles to more of a lap size. So as soon as my pattern arrived in the mail I did this to it. True the quilt was now more of a size that appealed to me, but as a basket quilt I thought I could do better. Then I ran across this, Miss Rosie also has this pattern called MoJo. It finishes at 76" x 76", a size I like. I liked this pattern better than my super sized Schnibbles pattern. Then it dawned on me that if I made this pattern, it would not qualify for the Year of Schnibbles Challenge, which made me rethink the whole basket concept. One thing that popped into my mind was that I really like the baskets with handles. While Miss Rosie's baskets are as cute as can be, I was missing the handle. 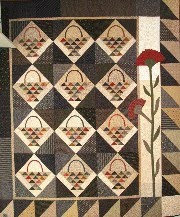 This pattern is called "Gathering Baskets" and is by Primitive Pieces by Lynda . This pattern is so me, the red, the black, the flower, THE HANDLES on the baskets. It's a nice mix of modern and traditional and is 80" X 86". So I've decided that this will be my first basket quilt. So I'll be eagerly awaiting the Picnic Parade on the 1st of December, sadly I won't have an entry, but I will have a basket quilt in my future! look, there's fringe on the fringe..... isn't it lovely!! Here's a better picture of it!! What do I do with this? If someone has or has seen a clever way to use this fabric edge please let me know! I would hate to chop it all up THEN find out what I was supposed to do with it! Also, I would like to add some green to this family, has anyone run across a good green that matches?